New and experienced Woodies alike are welcome! Muir Woods Rangers are excited to announce this development opportunity for volunteers, interns, and partners. 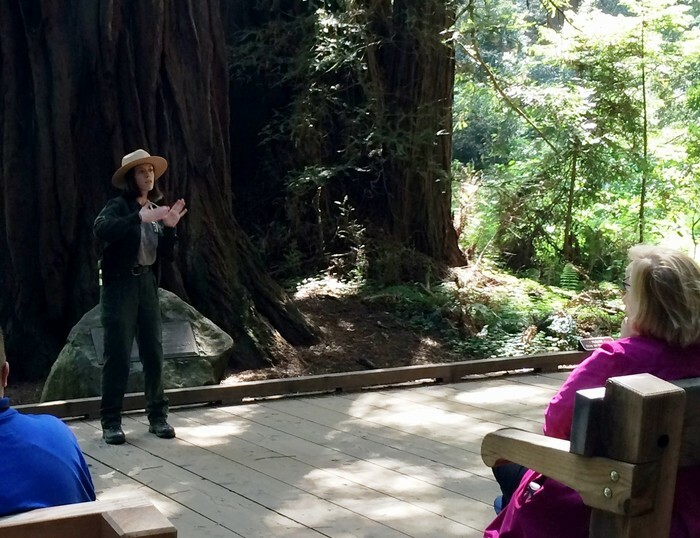 This interactive training, led by Muir Woods NPS staff, will apply interpretive theory and techniques to the wide variety of programs and visitor interactions we have at the woods. The material we cover is essential for anyone who serves as a resource interpreter. Like a boot camp, new NPS interpretive rangers typically go through similar training which lasts a week. We understand it is hard for you to carve out that much time, so we offer this very concise tailored version for you so that you can have the foundations to build on. After this training, you will make a bigger difference. In every visitor contact you make, you will have a clearer sense of purpose. As you answer questions or present interpretive programs, you will help visitors discover deeper meanings of Muir Woods by facilitating their emotional and intellectual connections with the park. In such a creative process, you will unleash more of your potentials as you apply the art of interpretation in the woods. Beyond the woods, the application of this art is limitless in your life. We hope you will adjust your busy schedule to join us in this intensive hands-on training so that we can leap forward as the Muir Woods Team. RSVP on this flyer or contact Todd at 415-388-2596, todd_hisaichi@nps.gov to sign up or/and for questions. Lunch is provided! We will meet at Ed Lab across from the annex parking lot.